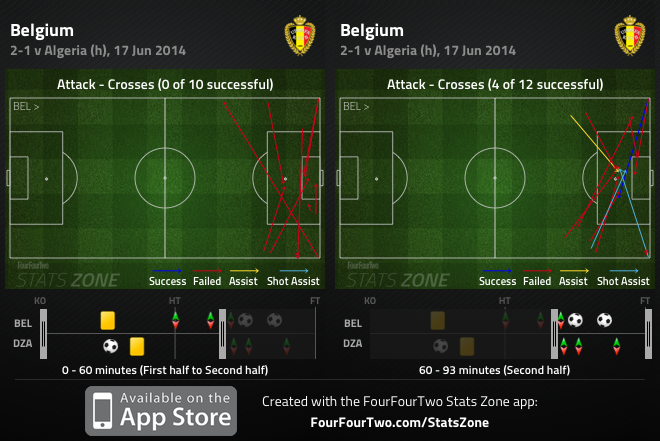 Belgium’s struggles were slightly surprising, they weren’t entirely unexpected. Algeria are tactically intelligent, flexible side – and while they’re capable of pressing high up the pitch, they knew that was a pointless strategy against a team with many great counter-attackers, and in a match where they would have taken a draw. Therefore, they played a defensive-minded side with Carl Medjani, as much a centre-back as a central midfielder, in the holding role and sat very deep. They got ten men behind the ball, allowed Belgium time in deep positions, and tested their ability to break down a packed defence. It wasn’t an impressive performance in a technical sense from Belgium. They were extremely sluggish in possession, and this was another piece of evidence that suggests the lack of top-class full-backs will be a problem – they needed quick, technical and positive players in wide positions, but instead Toby Alderweireld and Jan Vertonghen were tentative with their forward running and cautious in possession. 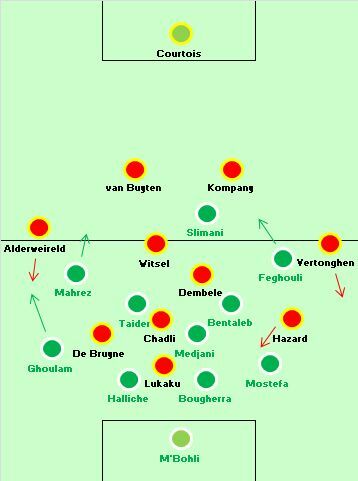 With Kevin De Bruyne on the right rather than linking play as the number ten – where Nacer Chadli was surprisingly fielded – the Belgians were unable to form any kind of passing triangles in dangerous positions, and for long periods the play was simply in front of Algeria. In terms of positioning and individual battles, this wasn’t an interesting clash because Algeria weren’t coming out to close down – there was no ‘midfield battle’, as such, because players weren’t looking to make runs beyond their opposite number. The one exception to this was when Axel Witsel twice decided to take advantage of his freedom, and surprisingly popped up between the lines for long-range shots, which tested Rais M’Bohli. Amazingly, Algeria went ahead despite barely getting the ball into the opposition third, and again Belgium were made to suffer in the full-back positions, this time in a defensive sense. Faouzi Gholam darted forward on the break down the left, and swung in a cross to the far post, where Sofiane Feghouli was pulled back by Vertonghen. Feghouli converted the penalty. It was obvious what was going to happen now – Algeria were going to play even more defensively, with no intention whatsoever to have possession. However, much like the USA the previous evening, they probably needed more counter-attacking threat to relieve the pressure. Belgium only threatened when they turned to the bench, however, and while it’s certainly possible to question Marc Wilmots’ starting selection, he used all three changes very quickly and effectively. Dries Mertens replaced Chadli, which meant De Bruyne could come inside and influence the game more in the centre (by full-time he was the game’s star man, having been anonymous in the first half) with more penetration from wide areas because of Mertens. But Belgium essentially went 4-4-2 and lobbed crosses into the box, having realised Algeria’s parked bus wasn’t going to be shifted. This meant the huge Divock Origi came on for Romelu Lukaku, and Marouane Fellaini replaced Mousa Dembele. Now Witsel continued to sit deep, with De Bruyne ahead, and Fellaini as a second striker alongside Origi. Algeria then got carried away attempting to get back into the game, and lost possession with four men ahead of the ball, and the full-backs high up the pitch – precisely the sort of situation they’d been desperate to avoid (and had, until Belgium’s equaliser). Hazard broke down the left in behind right-back Mehdi Mostafa, and squared for Mertens breaking in behind his Napoli teammate Ghoulam, and Belgium were ahead. Algeria were too exhausted to make a comeback. 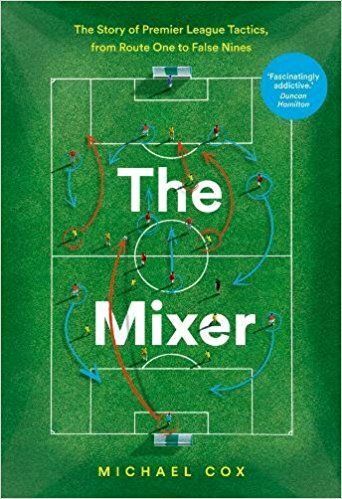 As predicted in the preview, Brazil brought in a midfielder for an attacker, a shift they make in almost every major tournament. Ramires replaced Hulk – fitness concerns played a part, but Hulk insisted he was fit, and either way, Felipe Scolari chose a hard-working shuttler in Ramires, rather than a proper attacker like Bernard or Willian. It was clear defensive shift. This was partly to contain the runs of left-wing-back Miguel Layun, who had impressed against Cameroon. Ramires marked Layun when the ball was on that flank, but moved inside and was closer to Andres Guardado when the ball was on the opposite side. In a purely defensive sense it worked reasonably well – Layun was much less involved, and only notable for a couple of wayward long-range shots. 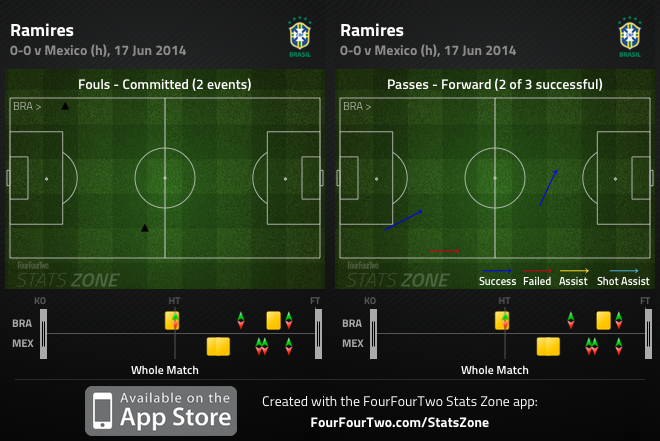 But it harmed Brazil’s attacking capabilities, and Ramires’ involvement summed up a scrappy first half. He committed as many fouls (2) as he made successful forward passes in his 45 minutes on the pitch. The tactical battle wasn’t as interesting as we might have hoped. Mexico’s wing-backs were much more cautious than against Mexico, which meant there was no great intrigue about how they’d be picked up, and limited opportunities for Brazil to break in behind. Brazil struggled to put together good passing moves, to supply Neymar and Oscar, and it was particularly obvious how much they lacked any direct running in behind the Mexican defence. Oscar, Brazil’s best player in the first game, was fielded on the left with Neymar again as a second striker. Ramires and Oscar switched midway through the first half, but we still haven’t seen Brazil’s format from the Confederations Cup last year – Neymar left, and Oscar as the number ten. Scolari did change things, bringing on Bernard for Ramires at half-time, which meant Brazil now had four proper attackers on the pitch. The introduction of Jo, in place of Fred, was also useful as Jo repeatedly charged in behind the Mexican defence, something Fred attempted only sporadically (usually met with an offside flag). Slightly surprisingly, however, Brazil’s best chances came from crosses. Thiago Silva twice found space when going up for set-pieces, while Neymar had a headed effort in each half, with a cross from either flank. This rather summed up their lack of creativity in open play, although they did force Guillermo Ochoa into the best goalkeeping performance of the tournament so far. Mexico seemed happy with a draw, although they threatened late on after the introduction of Javier Hernandez – again, like Jo, he offered pace in behind the defence, and the game became more stretched. Thiago Silva was forced into an extremely strong and somewhat cynical challenge as Hernandez attempted to slip past him ten minutes from time, the most nervous Brazil looked defensively. There’s not too much to discuss in this game. It was a simple 4-2-3-1 versus 4-3-3 battle, with both sides keen to play on the counter-attack, but South Korea doing more with possession of the ball, moving it quickly and attempting to get their attacking players more regularly involved. This smacked of two cautious sides desperate not to lose, in the belief this game was essentially going to decide who follows Belgium out of the group. The star players on either side provided a spark in the first half. Son Heung-Min stayed high up the pitch on the left, and had two efforts at goal, first from Koo Ja-Cheol’s lay-off, then from Park Chu-Young’s clever knock-down. Both shots were wayward, but it showed his threat, and Korea’s determination to give him the ball as quickly as possible. Russia’s forward, Alexander Kokorin, also showed a bit of magic in possession when launching a quick attack in a central position, dropping deep to evade a couple of challenges before teeing up Yuri Zhirkov. His shot was wild, and his overall contribution very disappointing. If there was one standout feature of the game, it was how uncomfortable both goalkeepers looked throughout, and therefore there was little surprise when the deadlock was broken because of a goalkeeping error. 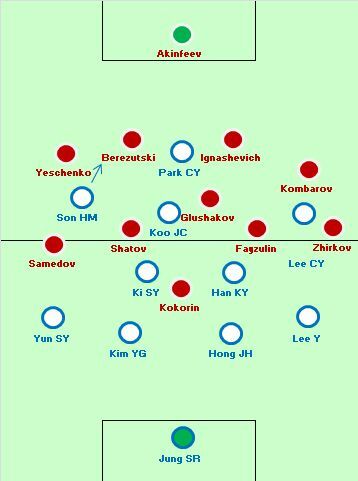 Both sides had repeatedly peppered the opposition goal with ambitious – and not particularly powerful – shots from range, and Korea took the lead when Lee Keun-Ho (on for Park upfront) produced a tame shot that Igor Akinfeev practically threw into his own net. Jung Sung-Ryong wasn’t much more comfortable at the other end, though. In fairness, Fabio Capello got his side back into the game with some good attacking substitutions. Alan Dzagoev had already replaced Oleg Shatov and was driving forward to connect midfield and attack, but at 1-0 down Capello introduced Alexander Kerhakov in place of Zhirkov, with Kokorin playing from a deeper, wider position. Igor Denisov also replaced Denis Glushakov, and showed more ambition on the ball – Gluashaov is a pure destroyer. And while Russia never sparkled, they were unquestionably more of an attacking threat. Kerzhakov’s movement was good (as always), Kokorin was more of a threat charging towards goal rather than collecting the ball in tight spaces, while Dzagoev offered some mazy dribbling. The equaliser was scrappy, but it featured Kerhakov turning in a rebound, after Dzagoev’s cross-shot from the right towards Kokorin at the far post. Russia simply had more threatening attackers on the pitch after the three changes, although this increased the frustration at Capello’s cautious starting approach – he’ll surely make changes for the next game. Australia v Netherlands – Australia fought back well after going 1-0 down against Chile, but the real interest is the Dutch, particularly what formation they play – will they switch to a back four? It’s really too bad that teams like Algeria take such a negative approach that they leave one of their best players, Brahimi, on the bench! Inevitably such teams end up with a loss or two and a draw or two and leave, whereas if they had taken a few risks, they might actually advance to the next round. And us viewers would have enjoyed some dribbling and attacking. Reminds me of Pekerman’s fatal decision to leave Messi on the bench in 2006. Amazingly poor. “Mexico’s wing-backs were much more cautious than against Mexico” there must be a mistake, Mr. Cox. Excellent article though, like always. yes belgium dont have fullbacks who can bomb forward . but then i dont think that was the problem is the first half . in the first half belgium tried to play too much compact . there were too many player in the midfield zone who were trying to get beyond the back four . even if you dont have good full backs you can just use one of the holding midfielders or you can just use the forward to make the diagonal run to stretch defense to stretch defense . 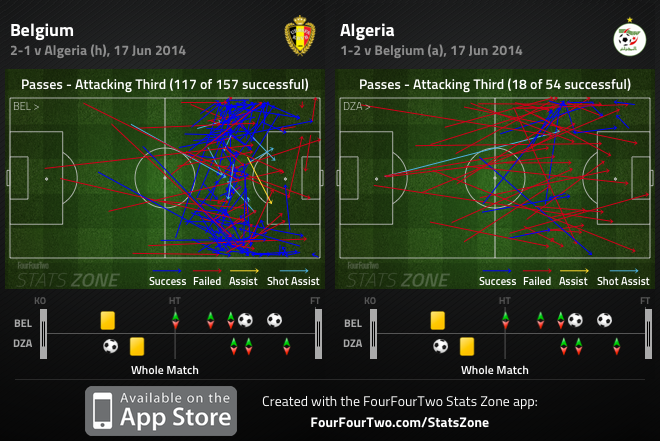 it was pretty evident that algeria were going to sit deep but belgium played into there hands in first half . there were hardly any crosses in the first half . much was concentrated in the central zone . then credit to brlgium and their coach who changed into the second half . you could see de bryune who was central in the first half started getting wide and supporting the wingers and the game changed . now much has been made about fellaini but fellaini wasnt played as a defensive players but was put up as a forward or just behind the striker so to make hullabo about him is stupidity . In the Brazil match it looked like Luis Gustavo was tightly man-marking Gio dos Santos. That seemed to do a lot to prevent Mexico from being effective in the attacking third. Noticeably, as soon as Gio came off, Luis Gustavo was freed up and started to get involved offensively. For what it’s worth, Origi is only 6′1″ – a couple of inches shorter than Lukaku – and he’s never scored a header as far as I can tell. I guess Lukaku was just hooked for being rubbish, and Origi is the only other actual striker in the squad. I think Origi introduction was mainly because he is a faster player. Belgium was slow and a fast pace was needed. That combined with a tall player like Fellaini did the trick. Credits to the coach. 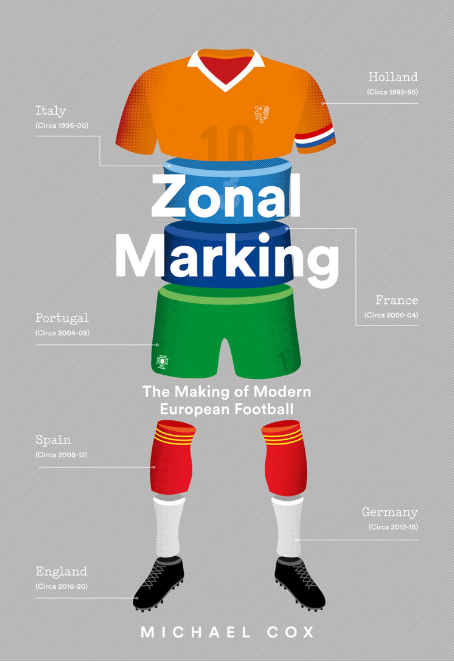 I love your articles, ZM – by far the best tactical analysis on the web – but sometimes I think they deserve a bit more proof reading! I don’t recall Mexico playing against Mexico?!? Really? That is your contribution? Is it coz perhaps you are female? Have you considered only one person writes here? Or sometimes as a writer counter-checking is too tedious? What does gender have anything to do with that? You bigot! You’re backwards, sexist attitude won’t hold any water here. Why don’t you educate yourself and try to make your community here and in real life a better place? Before you criticize Emile’s contribution (which I’m pretty sure is a French male’s name) why don’t you look at what you posted and ask what real contribution you made? Damn boy, you just got served! Actually, Emile’s a man name. Emilie’s feminine. For what it’s worth (which is zero, since who cares? ), “Emile” is typically a man’s name. Clearly males don’t read carefully enough (sarcasm). And as you can see he’s simultaneously writing for other websites (Guardian and ESPN) as well. Yes these could use proofreading, but they’re well enough written considering the time he has. Sorry, I do proofread, sorry, just absolutely knackered by this stage and all the teams/words merge into one…will fix! An interesting difference between Belgium and Mexico is their fluidity. Mexico has lots of simultaneous runs and players switching positions. This allowed them to dominate the match against Cameroon, in fact Peraltas goal came as the result of four simultaneous runs into the box. It also was a big part of the reason why they where so good in possession against Brazil. Belgium on the other hand has a much more rigid system. There is usually not more than one run at the time making it easy for the opposition to defend. For the most part the players stay static in their position and then try to do some magic when they get ball. On another note, why does Fred play? He does not contribute much to the build up play, he does not win duels in the box and his movement has not been impressive. He did score some goals in the confederations cup and one against Serbia before the world cup, but with the attacking talent on the Brazilian team I would expect any decent striker to net some goals. Scolari must have some reasons for using him all the time, but I can not see them. For me the Brazilian options up front are so limited that I would consider using David Luiz as the striker, with Dante taking his place in defence. David Luiz has good technique, so that he could participate in the build up play, he is fast enough too threaten in behind the defence and he’s good in the air. He would probably make some wrong decisions as he is not used to the position, but with his physicality he would be a menace and draw attention away from the other attacking options, as well as being a good target man if needed. On further thought, my guess for why Scolari uses Fred would be the following reasons. 1: Because of the limited time national teams have together he chooses his first XI long before the championship and sticks to it in order for the players to develop their relationship. 2: The Brazil attack worked well in the confederations cup, with Fred scoring 5 and he didn’t want to do any changes. 3: He made a gamble that Fred despite having had a bad season in Fluminese would perform well in the national team, because he has seen players have bad seasons at club level while performing excelent in international championships. Podolski and Klose would be examples of this. I’d say it’s mostly number 3 there. Fred is not the most technical of CFs, but he is not as bad as these first two games showed. He’s usually good with his back to the goal, dragging defenders and opening up space for the Oscars and Neymars to shine. Also, and most importantly, he sure can score. be it standing or on the ground, left or right foot, head, shoulder, knees or toes, he finds his way to the net. You mentioned in your previous article that Germany’s fullbacks didn’t overlap much either, but that didn’t stop them from scoring four, since the front three always sought to maintain width. Hazard aside, Belgium’s front four tend to drift in the middle. Both Mertens and Origi offer a dribbling threat from wide positions, stretching the defense and opening up space in the middle. As a Spurs fan I’m surprised with Chadli starting; yet to see any outstanding feature of his game that justifies taking up one of the forward slots despite his lack of initiative. I think the Belgium manager deserves great credit for switching tactics in the second half. It showed Belgiums biggest strength, their ability to switch shape and players due to a great squad. If anything their downfall will probably be their plan A failing badly against better teams. Also thought it was interesting verm didn’t play, as he is probably too aggressive in his position alongside the already aggressive kompany. Van buyten better at covering for kompany. 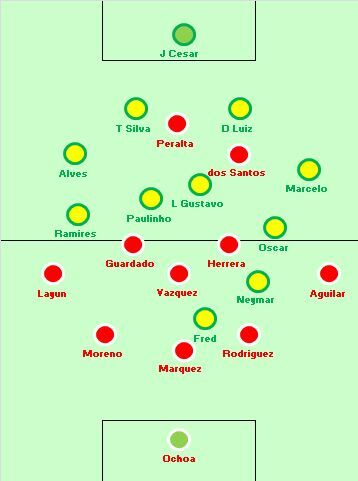 Changing the subject to Brazil, I was surprised at how little impact the fullbacks had, they had plenty of cover and should have been the game changers against Mexico. Instead brazil lacked width and penetration, playing into Mexicos hands. Looking at the bigger picture, brazil need to revert back to their settled shape, neymar in space with plenty of options. Right now he looks isolated and brazil have lacked invention. True about Brazil’s full backs, but i believe it was a way to prevent runs in behind from the mexico wing backs. It was a close game in possession (54/46 if i’m not mistaken) and everytime Mexico got the ball the wings would go forward. After what happened against Croatia (the own goal came as the result of Alves being caught too high when Brazil lost the ball) it is reasonable to think that Felipão might have advised Marcelo and Alves about that. Could anyone elaborate on the plan A-plan B topic for Belgium? I don’t quite understand how Chadli positionning (or playing behavior) had such a big and negative impact on De Bruyne’s. Is that because Chadli played kind like a second striker and De Bruyne felt compelled to fill in the center of the field? Or is that because both play actually the same way (AMC)? Mertens came in as a Winger or as a AMC and De Bruyne stayed Winger? If anyone could clear that up… Thanks in advance. “huge” Divock Origi came on for Romelu Lukaku? If anyone is huge, it is Lukaku. Just wanted to say huge thanks for writing up these reviews after each match. Just watching all the games has been a daunting task, but to write about them with such insight as well… Thanks mate! Really good article as always. I imagine that watching all the games and writting about them must be exhaustive. Yet you keep the analysis very interesting; congratulations on that. About Brazil x Mexico, i also thought it was intriguing that Mexico insisted a lot on long shots. Seriously, at some point it felt like they were trying to force Julio Cesar to make a mistake. 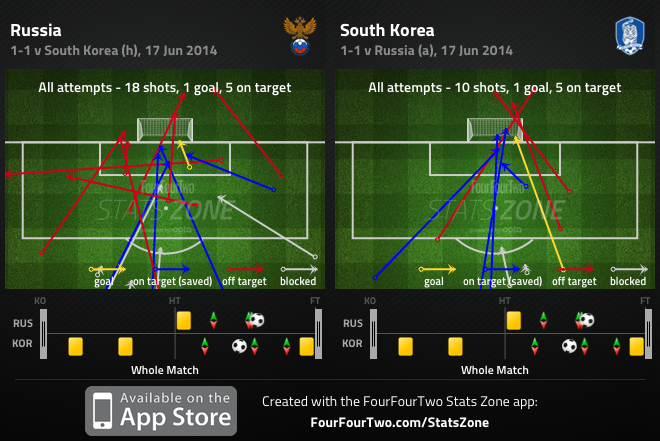 Good for the Seleção that the shots went wide practically all the time. It was frequent to the point of seeming a recommendation from the coach.